Natural processes have been “restoring” natural disturbances (landslides, volcanic eruptions, glaciation, etc.) forever. Mr. Polster will talk about how we can use these same processes to help the land heal and restore sites such as mines and industrial developments that we disturb. 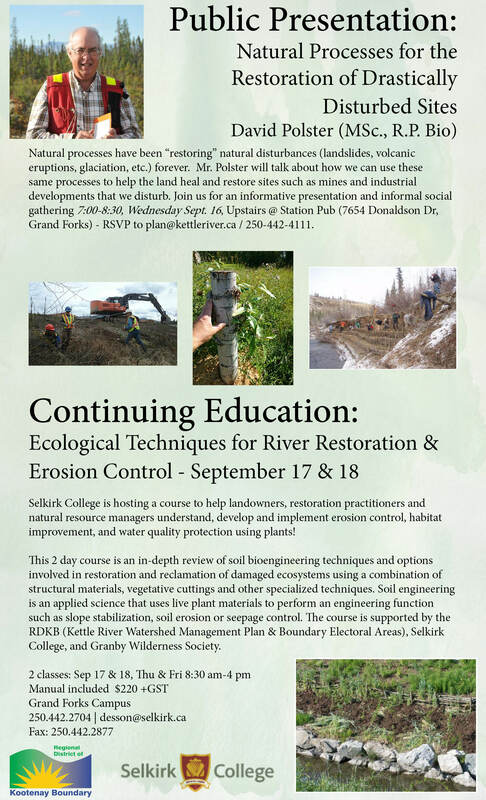 Join us for an informative presentation and informal social gathering 7:00-8:30, Wednesday Sept. 16, Upstairs @ Station Pub (7654 Donaldson Dr, Grand Forks) – RSVP to plan@kettleriver.ca / 250-442-4111. Thank you to everyone who has submitted comments and feedback on the draft Kettle River Watershed Management Plan – your ideas and comments are invaluable and will help us complete revisions to the plan that reflect the interests and priorities of the community. While our deadline for comments was set for today (October 14), we would still like to encourage organizations or individuals to provide their feedback going forward, and we ask that you get in touch if you would like to schedule a meeting or discussion. All feedback will be held for future consideration as the Watershed Management Plan is intended to be a ‘living document’ (more like computer software than a house foundation), with improvements and new components added during scheduled reviews during implementation. Revisions to the Plan will be discussed at a Stakeholder Advisory Group meeting at the beginning of November, and the Plan will be presented for endorsement by the RDKB Board of Directors at their November meeting. After that, organizations and stakeholders will be asked to receive the Plan and participate in implementing the various strategies and priority actions. 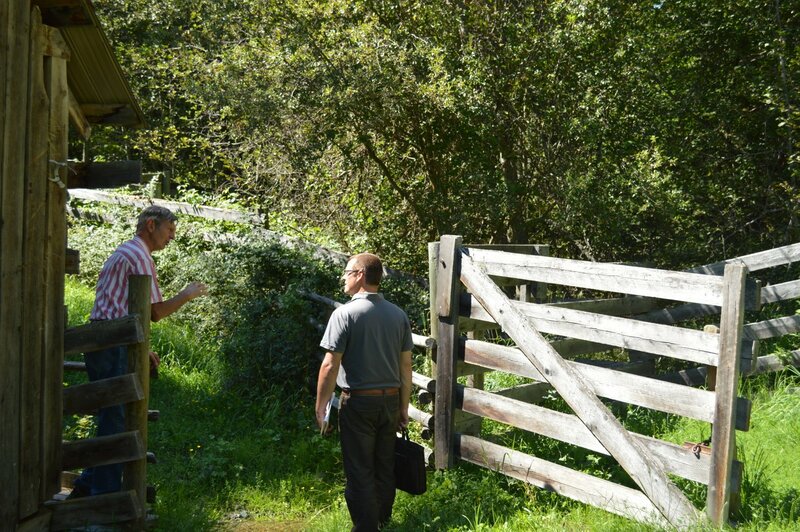 Forester, rancher and land steward Fred Marshall instructs Graham Watt on the ins and outs of riparian protection (Cavan Gates photo). After typing thousands of words and clicking countless times, the data entry for the survey is now complete. Final numbers are 657 surveys returned from approximately 5000 households. Almost all (620) were from paper submissions and the remainder were either emailed in using the original pdf form or submitted using the online form. SURVEY NOW CLOSED – Thank you for all your submissions – they will truly help us as we develop recommendations in the Watershed Management Plan. Stay tuned for survey results in early February. 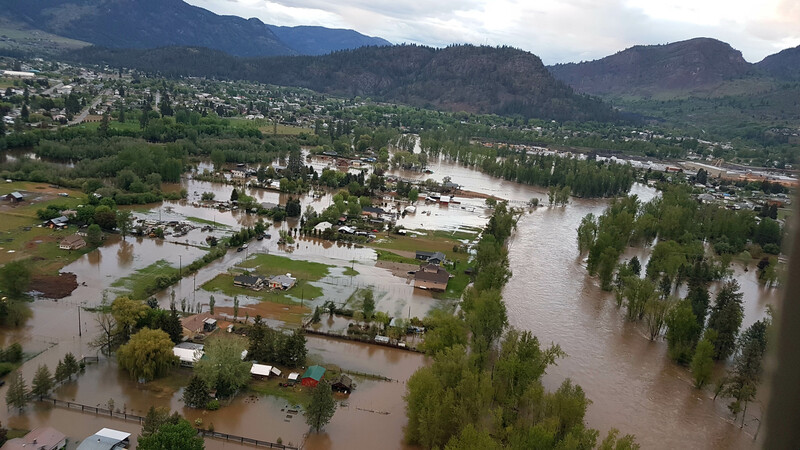 The Kettle River and its tributaries are known to be essential to the quality of life in our communities and rural areas. Our communities use and value water in the watershed for many reasons. 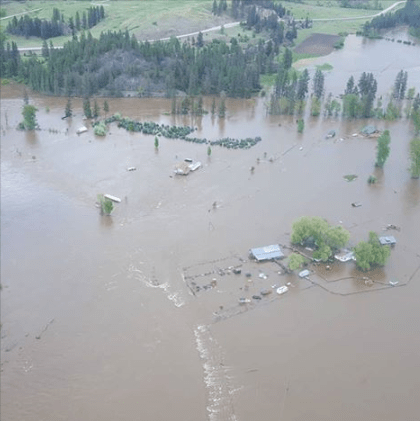 Developing a Watershed Management Plan for the Kettle River will involve balancing the many expectations for water with the needs of the natural environment. By taking this short survey, you will make sure that we know which watershed uses and values are important to you. In the first week of October the survey will be mailed to all residents and non-resident landowners in the Regional District in Areas ‘C’, ‘D’, and ‘E’ as well as Grand Forks, Greenwood and Midway. If you fill out the printed survey, return it using the stamped and self-addressed envelope. Alternatively, you may fill the survey linked below and press “submit” when you finish. Please complete the survey by November 16, 2012. Due to continued interest we will extend the deadline for electronic responses to December 31. Alternatively, you can print the survey and mail your results to the above address.